One of the one million reasons I love Italian and generally Mediterranean cooking is the simplicity. A familiar attitude of the Italian Chefs is; Use fresh, simple, whole ingredients and try not to screw it up. In other words, let the food speak for itself and don't get in the way. When my local seafood market had a special on this gorgeous Red Snapper - I knew Dinner was a cinch. 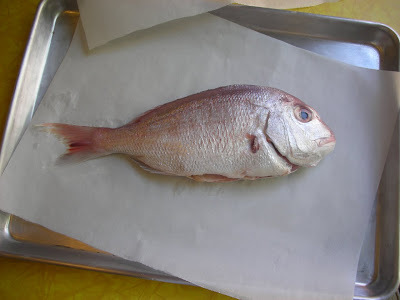 Red Snapper is a hardy white fish that can take hot or sweet spices and fresh or dry herbs and make them sing. The thicker skin on the Snapper keeps the fish well intact and makes it great for grilling, barbecue, roasting and frying in a whole form. The taste is nutty, filling and oh so healthy. 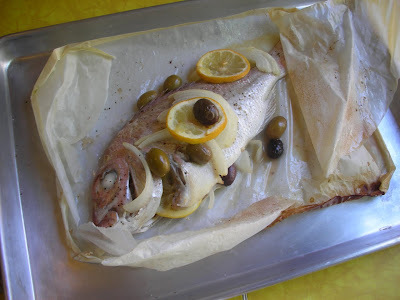 And nothing could be easier than placing the fish inside a parchment envelope, throwing in a few aromatics, olives, lemons and a dash of white wine, closing it up and within minutes - Dinner is served! This is a perfect dish for working folks on a time budget, and it has enough WOW-factor for a dinner party. Ask your butcher/fish monger to gut and scale, but leave the rest to you. Choose a specimen that has bright eyes, tight skin and a fresh smell (good advice for a date, too, right? ) 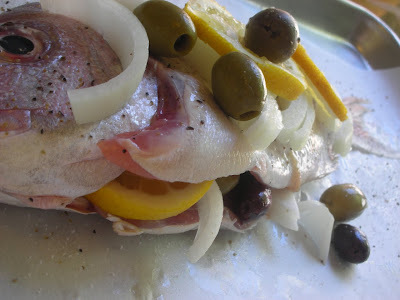 Stuff the fish with lemon slices, dash of salt, pepper, a few olives and a couple wedges of tomatoes or a squash vegetable is good. Preheat the oven to 375 F. On a large baking sheet, place an equally large sheet of parchment paper down and drizzle a little olive oil in the center. Then place the fish in the middle. 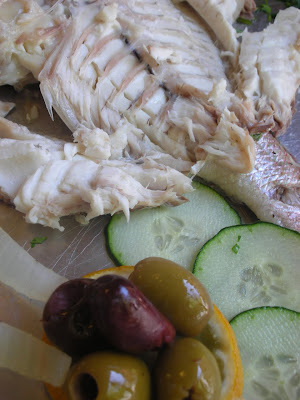 Add, to your tasting, a few sliced onions, olives, capers, tomatoes, chopped parsley or dill and/or large chopped squash veggies on top of the fish. Season all over with salt and pepper (add a few red chili flakes too, if you like.) 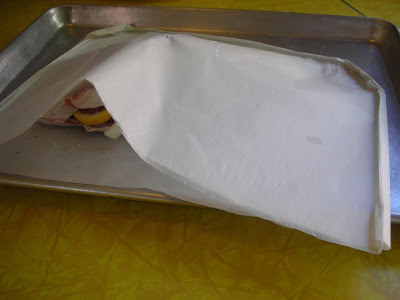 Then loosely drape another sheet of parchment paper over the fish and begin to fold three of the four sides up twice into an envelope. Before closing up the last side, add a couple tablespoons of dry white wine (or use lemon juice) to the inside. Fold up the last side twice. At all four corners, fold the corners over toward the middle creating a security lock for the side folds. Place the whole pan with the enveloped fish into the oven for 20 minutes. Remove the pan and let the fish and steam settle unopened for about 5 minutes. 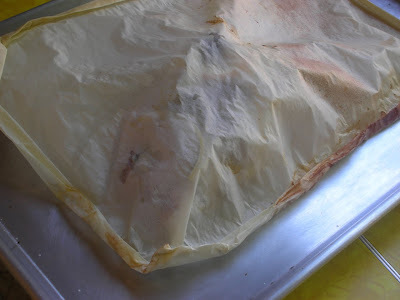 Carefully tear the parchment open from the middle. 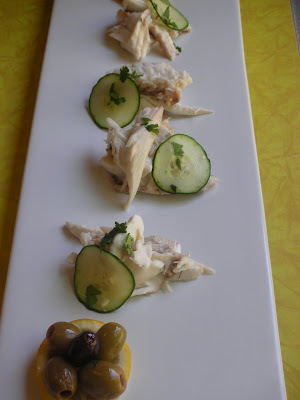 The fish can be served table-side and the au jus spooned over rice, or pasta - OR remove the fish from the bones and serve presented with the roasted olives and veggies. You may also want to pour the pan juice off into a sauce pan and reduce by a third, then whisk in a tablespoon of butter for a nice sauce. 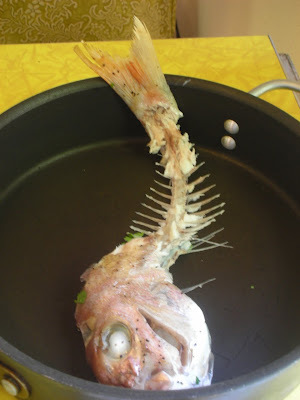 One last idea: save the bones for making fish stock - you'll love yourself later. You go! Snap, snap, snapper! I had no idea this recipe was going to only take 20 min. I honestly think I am going to go to wholefoods and buy me a fish right now. what a great surprise for when my fiance comes home. I don't have to tell him it only took 20 min right?